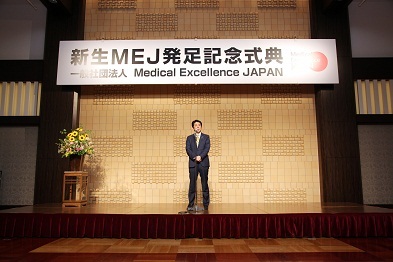 On June 13th 2013, the new enterprise establishment ceremony of “General Incorporated Association Medical Excellence JAPAN” (MEJ) was held at the Hotel Okura, Tokyo. Prime Minister Shinzo Abe, Chief Cabinet Secretary Yoshihide Suga, Minister of Economy, Trade and Industry Toshimitsu Motegi and Health, Minister of Labour and Welfare Ministry Norihisa Tamura attended the ceremony and delivered congratulatory speeches. The ceremony was successful with more than 300 participants including government officials, ambassadors and medical experts from Japan and overseas. MEJ was established in 2011 with the support of the Ministry of Economy, Trade and Industry. To achieve additional progress, MEJ expanded its framework by participation of 23 business enterprises and more than 50 medical institutions (as of April 2013). Med in Japan has been a part of MEJ since its foundation. Med in Japan is willing to contribute to the development of exchange in medical field around the world as well as hold more activities aimed at the overseas development of medical services and equipment.